The teacher wanted these Year 1 pupils to listen to the story of Goldilocks and the Three Bears, contribute to discussion and ask questions as appropriate. The follow up activity was to re-tell the story either verbally, in writing or by drawing a picture. She used a storyboard with a mix of symbolised cards and illustrations, with toys for the main characters. There were 10 in the group in this Literacy lesson. Children attended really well and joined in with telling the story. One of the children who had behavioural difficulties was encouraged to contribute to the story and was attentive throughout. He was able to produce a drawing at the end of the story that was easily recognisable. He really enjoyed getting the positive praise he deserved. Another child was able to stand up in front of the rest of the children and re-tell the story using the symbols and vocabulary. 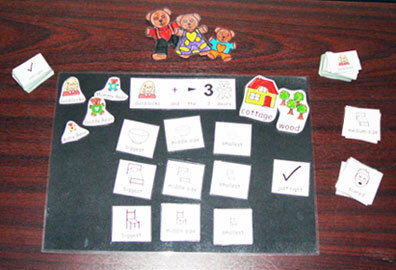 Children with a range of abilities were included in this activity and worked well together.